Internet based - accessible from everywhere, at any time. Possibility to extend the functionality according to customer needs. Exclusive reliability, thanks to the latest IT technologies. Guaranteed 99.95% service uptime. Pay only what you use when you need it. What is necessary to use it? GPS/GPRS device - it can be even a cell phone (with internal or external GPS) or one of these devices. SIM card with data plan - choose a local GSM operator at your discretion. geotrack24 account - with each new account you get 5.00€ free credit, enough to test and evaluate the service. We combined three ubiquitous technologies to make this possible - Internet, GPS and GPRS (cell phone network). Internet provides 24/7 online service, GPRS provides communication channel to transfer data from devices to our server and GPS provides global position coordinates. Share information with partners and friends. 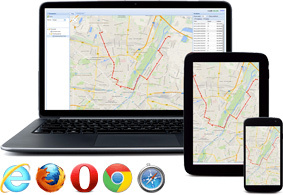 Start your own GPS tracking service in minutes. To start there is no need to pay, each new account is with 5.00€ free credit.